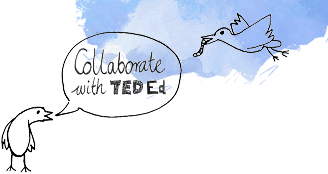 A primary focus of TED-Ed is to provide high-quality lessons taught by exceptional educators. If you or someone you know is an engaging expert that you think should teach others, please nominate them through our educator nomination form. Before submitting this application, please review how TED processes the personal information you provide via this form. We will evaluate your nomination form with the TED-Ed Team and may contact you for more information. Once you submit the form, we keep it on file for references and for future needs we may contact you in the future. We are looking for excellent visualization artists who are interested in developing animations on a freelance basis. If you are or know an animator interested in working with us to produce education videos that will be featured on TED-Ed, please let us know through our animator recommendation form. Links (to reel, storyboard, website, etc. Please separate by comma.) Why do you think this animator may be interested in working with TED-Ed? TED-Ed Clubs is a flexible, school-based program that supports students in discussing, pursuing and presenting their big ideas in the form of short TED-style talks. Watch the video or explore the stories below to learn more. Check out the FAQ or send us a message.